A UK instrument has captured "the sound" of the wind on Mars. 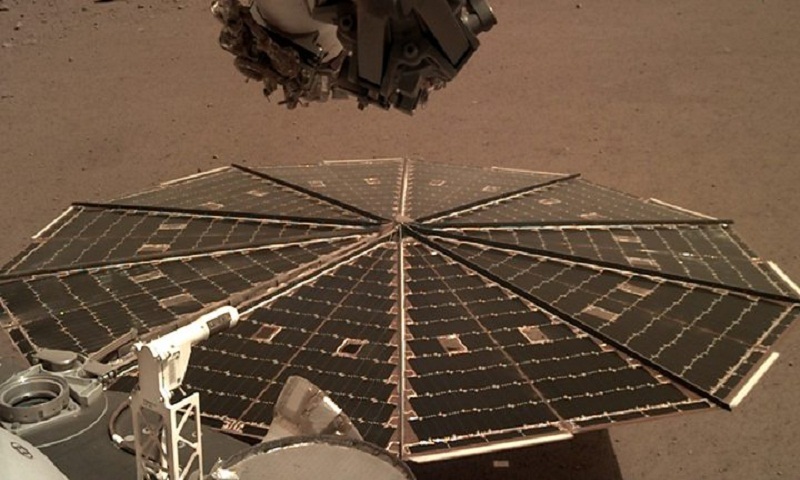 The British seismometer package carried on Nasa's InSight lander detected the vibrations from Martian air as it rushed over the probe's solar panels. "The solar panels on the lander's sides are perfect acoustic receivers," said Prof Tom Pike, who leads the seismometer experiment from Imperial College London. "It's like InSight is cupping its ears." A pressure sensor that is part of InSight's meteorological experiment also recorded the passing of the wind. Nasa's InSight spacecraft is the latest robotic resident on the Red Planet. After making a dramatic touchdown on 26 November following a six-month journey from Earth, the probe is now surveying its surroundings and testing its systems. The ultimate aim of the mission, which is sited on a flat plain just north of Mars' equator, is to study the world's interior. The data should reveal the position and nature of all the rock layers below the surface of Mars - from the crust to the core. It is information that can be compared and contrasted with Earth. A few weeks from now, the package will be lifted on to the ground by a robotic arm and covered with a wind shield. This bell-shaped device will protect SEIS from the weather and allow the sensors to concentrate on their primary task of detecting earthquakes, or rather "marsquakes". Co-investigator Dr Neil Bowles, from the University of Oxford, said: "To get the first data from the seismometer instrument package has been fantastic and even with a short test run the analysis is now full swing. "To 'hear' the low-frequency rumble of the Martian wind on the lander being picked up by [SEIS] is really eerie and provides a strangely human connection to this very different environment." The organisation's head of space exploration, Sue Horne, said: "This is brilliant news because it means we know the sensors have survived the rigours of landing on Mars and are meeting the requirements to achieve their science goals. "It is just amazing to hear the first ever sounds from Mars."